So I went through my queue in Ravelry weeding out patterns that for some reason or another I liked. On some, I had the 'what-was-I-thinking' moment?!! But, I came across a bookmark that I had queued sometime ago. I love bookmarks and love to read. I recently did a Bookmark Swap through Swap-Bot and got an awesome, wonderful Butterfly bookmark! Which come to think of it, I need to ask her where she got the pattern from. I definitely need to make one. My Filigree bookmark only took me around 45 mins to an hour to make. It was very quick and easy. On the first one I used a varigated yarn and although I love the color, I think it detracts from the design. It's a great instant gratification project! Happy New Year everyone! I hope this new year will be a blessed one for you and your family! I'm sorry it's been so long since my last post. At my work, they have us working like mad men/women! For the last 3 weeks, we've been working 7 days a week. Four 10 hr days and three 8 hr days. I've had hardly no time at all to do any crafting! But, I have made a few things! I wanted to share my last finished project. I'm making some coasters for my friends and family. 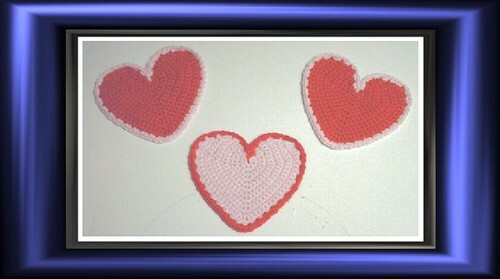 These are the Be Mine Coasters from the latest Crochet Today issue. It takes me about 15-20 minutes each. I wanted to attach some shelf liner foam stuff to the backs to make them non-skid. But I'm not sure how well that would turn out. We'll see.